A DnD group is just starting their first session when fairies port them off to a fairy glen to perform their game on stage in front of a fae audience. The cast of two art college students, a barista, a high school student, and a middle school age kid sister are worked to exhaustion then entrapped with fairy food at the banquet the next morning after dawn interrupts the fairies' magic. Treon is their nonbinary game master, autistic and pansexual dom. Daiki, playing a faun druid, is an autistic sub and art student. Duria, playing a human theif, is a lesbian trapped in an abusive relationship with an older man. Paul, playing an elf barbarian, is a quiet, gay art student. Winter, playing a half-devil alchemist, is an asexual kid sister punk. Written by an autistic lesbian with a history of trauma, watch as I try to treat the characters with kid gloves but it all goes wrong. I even censored the swearing under the idea that this would all be kid friendly. Ha. Hahaha! Anyway, love them because I do. In chapter two, they start to play the game but stop when Treon has to go remove their chest binder in private. During this break, the players get up to various mischeif and the fairies try to understand the game. 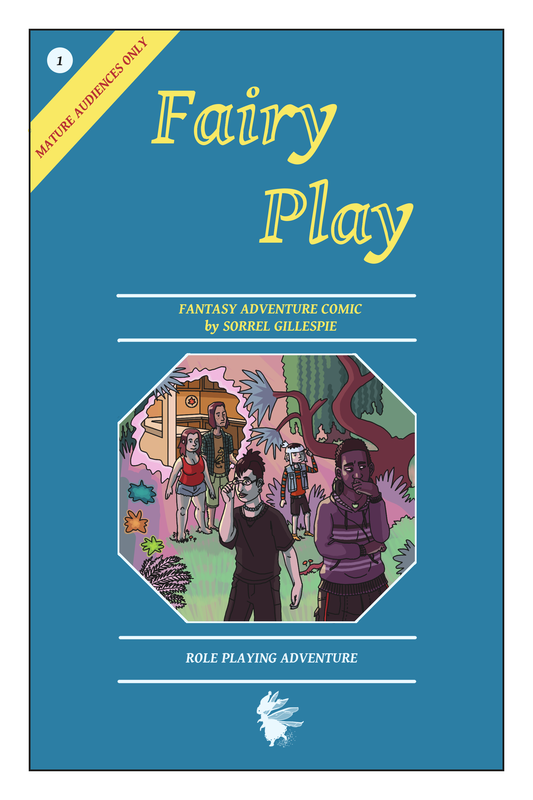 In this arc, the humans enter the fairy glen, and the play begins. Now that the origins for each character's character are laid out, it's time to bring them together into one generally unified party.